See what's on your servers. No more mysteries. With FTP Site Manager 2 you can easily transfer and manage your sites. Avoid clogging-up your server with old version and files. Select files and folders on your computer and the server and click on the arrows between the two panels. 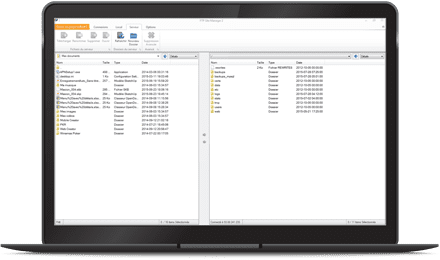 Connect to your host's server and see all the files and folder like a normal folder. Drag-and-drop from any local folder. Configure and save settings to make connecting to your server faster. Integrates automatically with WebCreator and replaces the basic tool. Copy a full website or transfer files individually. LMSOFT will use your email for this transaction only. The information will not be stored.